Yesterday’s price action on the usd to cad was a replay of the previous day in which the candle of the day ended the session as a down bar, albeit with a slightly shorter upper wick and the body sandwiched neatly between the 9 and 14 day moving averages. The open of the day found significant resistance from the 9 day moving average which it only breached momentarily before falling to close the session and conversely finding some minimal support from the 14 day moving aver. This bearish sentiment towards the US Dollar appears to show little sign of abating, a sentiment which has carried over into overnight trading in Asia where the Shanghai Composite appears to have shaken off its earlier jitters and followed Wall Street higher. Last night’s late surge on Wall Street took the S&P back over the 1000 price handle as investors latched onto a much better than expected Philly Fed Release of 4.2 against a forecast of -1.9 while choosing to ignore the worse than expected unemployment claims. If traders and investors maintain or even increase their appetite for risk then there is no reason to suppose that the usd to cad will be looking to re-test the USD1.08 price point sooner rather than later. The outlook for today’s forex trading on the usd to cad looks bearish once again, particularly as the overnight price action has round resistance at the 9 day moving average once again so my trading suggestion today is to continue to look for small short positions on an intra basis but bearing in mind that there is support line in place at the USD1.076 price level which may halt temporarily any further falls. 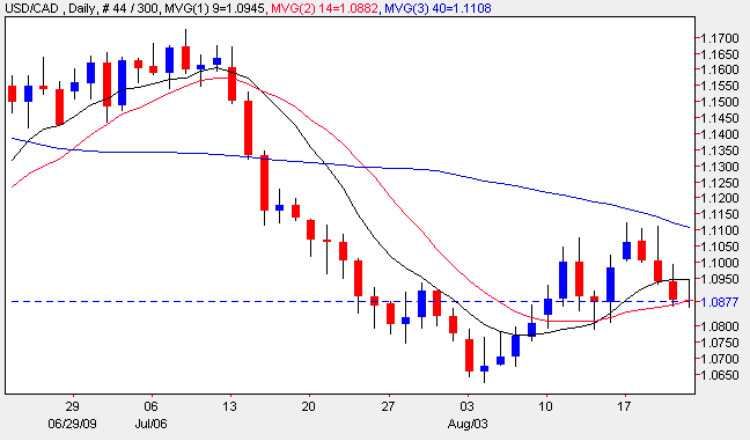 Should this be breached we will no doubt see a re-test of the USD1.065 level where the rally stalled in early August. With no fundamental news on the economic calendar for Canada today and only the Existing Homes Sales for the US which are expected to post a figure of 5.03m – an improvement since last month, the markets will be focused on the Jackson Hole Economic Symposium – the annual meeting of the world’s central bankers and a speech from Fed Chairman Ben Bernanke entitled “Reflections on a Year of Crisis”. On Saturday Bank of Canada Mark Carney is also expected to deliver a speech at the Symposium and it is likely that his words will impact the usd to cad when the forex markets open once again for trading on Sunday.